Long featured in travel magazine articles, Sleeping Bear National Lakeshore has come to the forefront since being named ABC Television’s Good Morning America’s “Most Beautiful Place in America” in 2011, and listed as #1 among Dr. Beach’s “Best Great Lakes Beaches” the same year. In 2012 National Geographic included Sleeping Bear on its “10 Best Summer Trips” list. Sleeping Bear’s recognition as one of Nature’s masterpieces of the work of glaciers, lakes, wind and water, led to its 71,000 acres being given National Lakeshore status in the National Park System in 1970 (refs. 1, 2). Just as significant was the designation of over 32,000 acres of that area as ‘Wilderness’ in the National Wilderness Preservation System in 2014. The region’s topography is the product of more recent geologic history, particularly from the Pleistocene or great ice age to the last melting of North America’s continental glaciers, and the post-glacial history of the ancestral Great Lakes (refs. 3, 4). That complex history of events resulted in today’s fantastic scenery and the four seasons’ attractions of the region. While the inland area is of great interest, the focus here is on the beaches and associated modern dunes. Sleeping Bear National Lakeshore has a 35-mile mainland shoreline, plus approximately 30 more miles of coast on North and South Manitou Islands. Artifacts tell us that the area has been an attraction to humans since the stabilization of lake levels around 3000 years ago. Europeans first visited these shores in the 17th century when French traders plied the lakes, followed by the English in early 1800s. 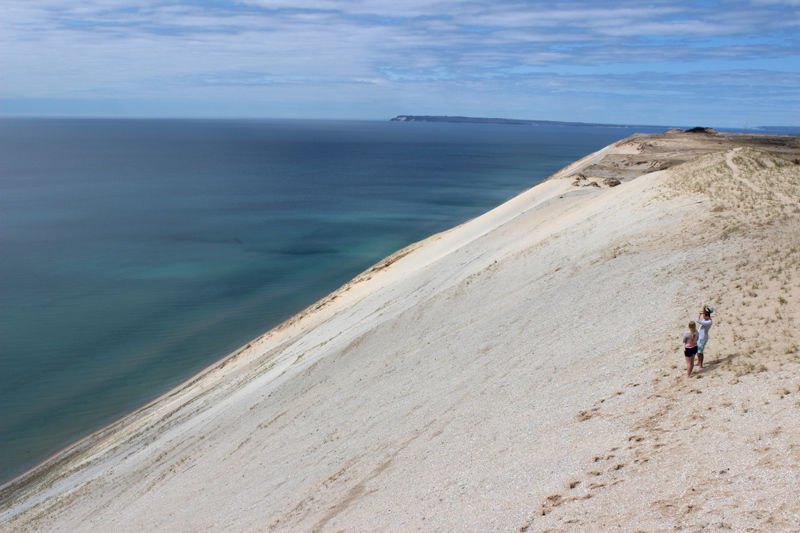 One of the earliest recorded dune climbs was by the fur trader Gurdon Hubbard who climbed Sleeping Bear with a companion and then hop-skipped-jumped back down the slope (mimicked today at the Park’s dune climb by the thousands). But the area attracted only light settlement. 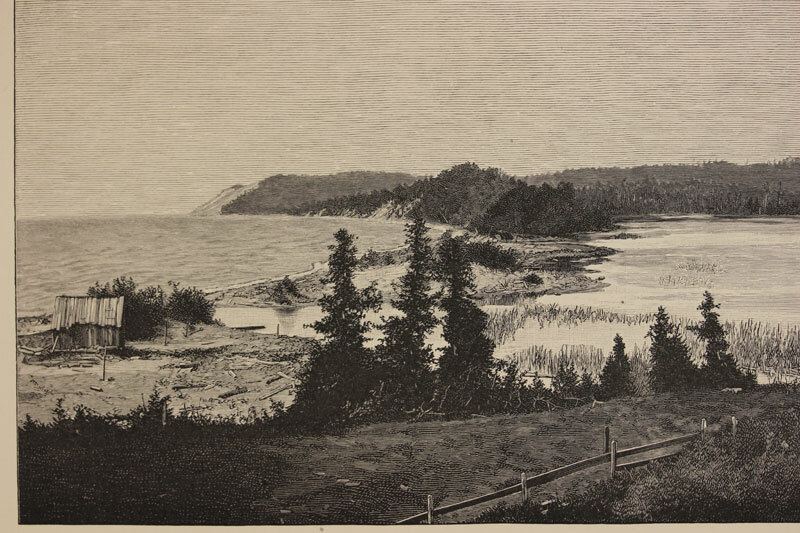 In 1884 G. K. Gilbert, a pioneer geologist, authored “The Topographic Features of Lakeshores”(p. 69 -123 in the Annual Report of the Director, U. S. Geological Survey) based mainly on his studies of shorelines in the Great Lakes and the Great Salt Lake. His Plate XIV (Figure 1) reproduced a map showing much of what is now the SBNL area, although not all of the shoreline. Note that only one village, Glen Arbor, was shown in the area. The shoreline topography consisted then, as today, of high-dune headlands, separated by lower topographic areas characterized by embayments. 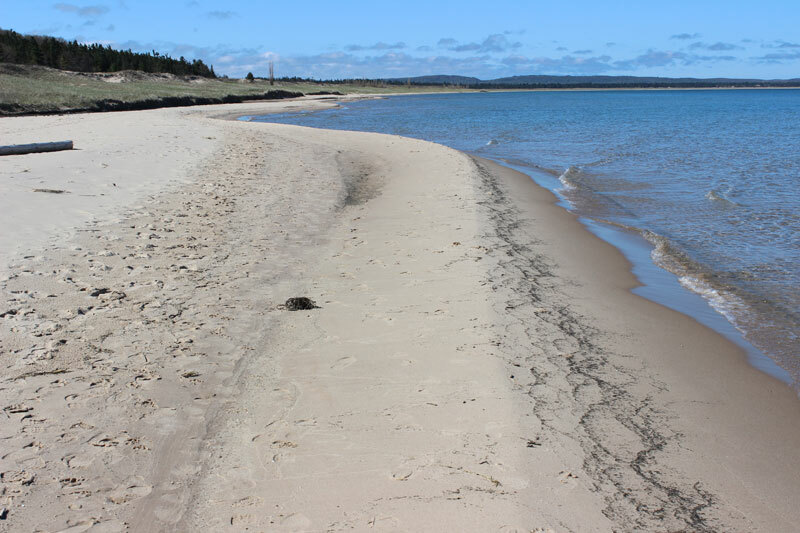 The embayment shores are consistently where the best beach/dune systems formed. 1. Platte Bay Beach extends from Platte River Point at the south end of the bay to the Empire Bluffs. This beach is one of the two larger beaches in the Park, running the length of the Platte Bay shore. An active dune field has grown at the mouth of the Platte River to form Platte River Point, and the beach is a sandy gravel becoming increasingly sandy to the north (Figure 2). The beach in the mid-bay area is wide, with a grassy dune field extending back to the forest (Figure 3). During the summer months, small nearshore sandbars migrate onshore and weld onto the beach, causing it to widen. The same sand will be carried offshore again in Fall storms. The beach face is constantly being sculpted by waves and breaking-wave swash which forms a variety of patterns, and often concentrates thin layers of heavy minerals (Figure 4). Bring a magnet to the beach and you will be able to separate magnetite from the other high-density minerals. Otter Creek is popular spot on Platte Bay Beach, particularly with bathers when the lake water is considerably colder than the sun-warmed shallows of the creek (Figure 5). This locale is a good observation point to see the interplay between the beach, creek mouth, and waves. The floor of the creek is covered with various patterns of current ripple marks, in contrast to the wave ripple marks on the sandy bottom of the lake. Platte Bay Beach narrows to the north as it approaches Empire Bluffs. 2.The Empire Bluffs form a headland boundary between Platte Bay Beach and the more northerly Empire Beach which extends along a lowland until it again narrows as it approaches Sleeping Bear Dune (Figure 6). 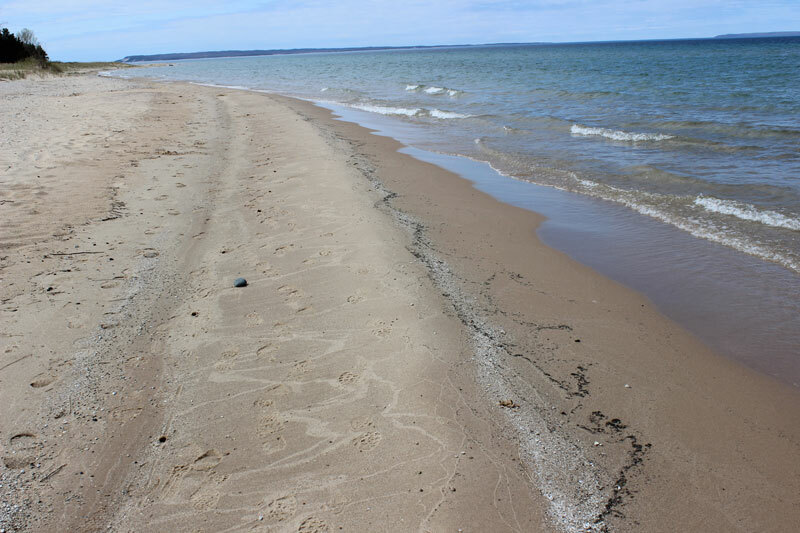 Although now not a pronounced bay, at one time Lake Michigan extended farther inland, but was cut off by a spit or emergent sand bar that eventually extended across the bay and cut off the body of water to form South and North Bar Lakes. 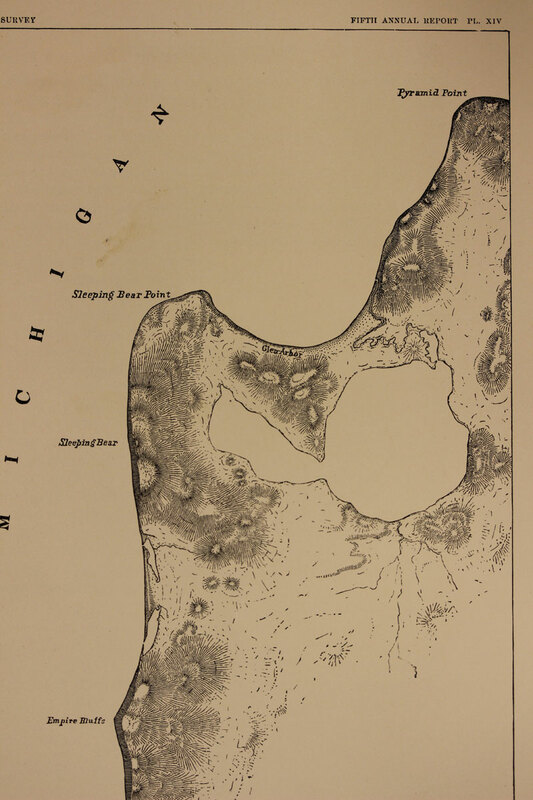 Plate VIII of Gilbert’s 1884 study illustrates the bar/spit that formed off the headland to the north and cut off South Bar Lake from Lake Michigan (Figure 7). Part of the town of Empire is now located on that forested sand ridge, and a younger beach/dune has accreted lake-ward. 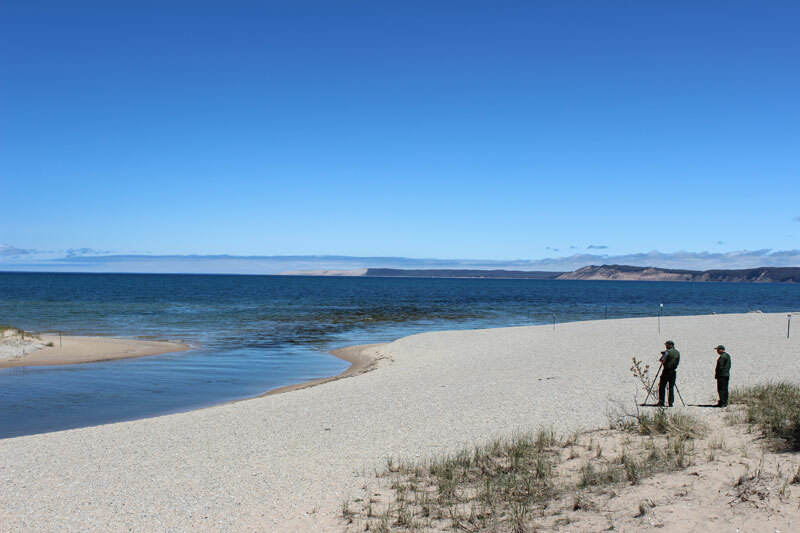 The beach is widest at the village of Empire (Figure 8), in front of South Bar Lake, and continues to the North Bar Lake area before narrowing in front of the massive Sleeping Bear Dunes (Figure 6). These high dunes are ancient in the sense that they formed thousands of years ago, although they are still evolving. Part of their spectacular elevation is due to their “perched” origin (Figure 9). These dunes are sitting atop older glacial, lacustrine, and fluvial deposits. The northern end of this ancient perched-dune field forms Sleeping Bear Point, and there is a narrow beach fronting the steep dune face. 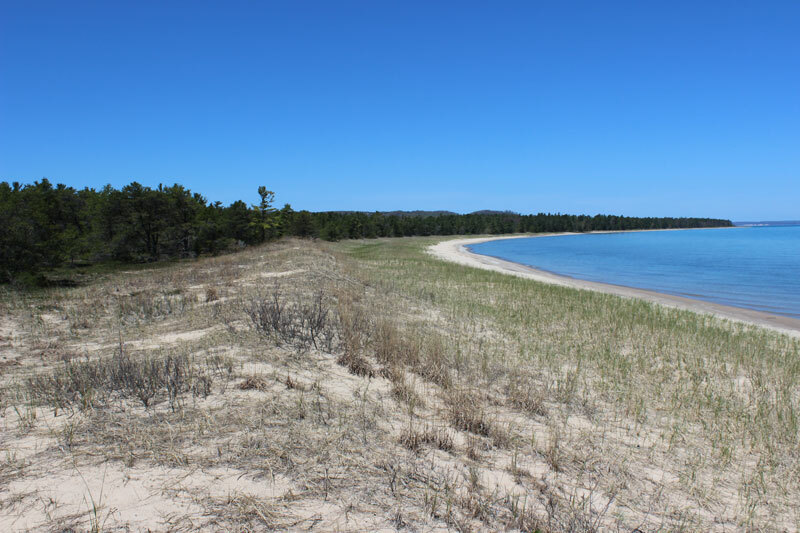 3.Sleeping Bear Bay is another pronounced embayment, yoked by the westerly Sleeping Bear Point and Pyramid Point, another headland of eroding sands to the east/northeast (Figure 1). 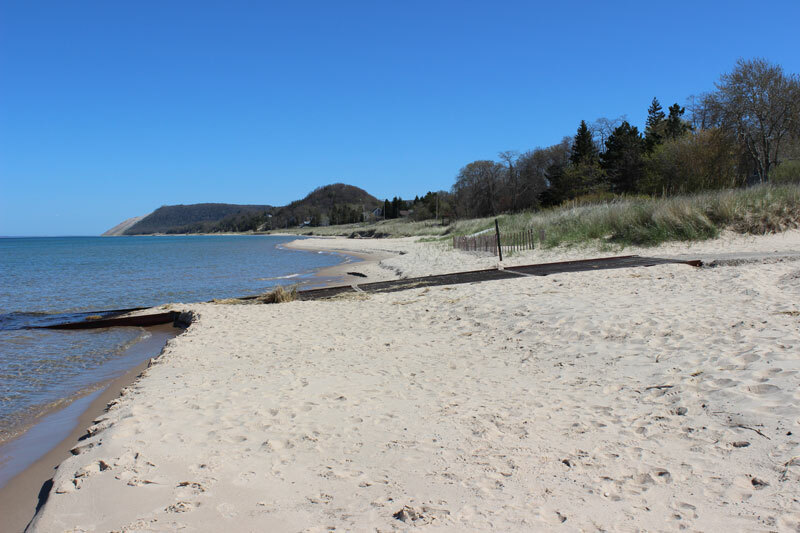 The beach here is best developed from the old Coast Guard Station (Figure 10) and Glen Haven Historic Village to the area north of Glen Arbor and the mouth of the Crystal River. Active dunes line the back-beach area. 4.Good Harbor Bay Beach rivals Platte Bay Beach by its size and beauty. 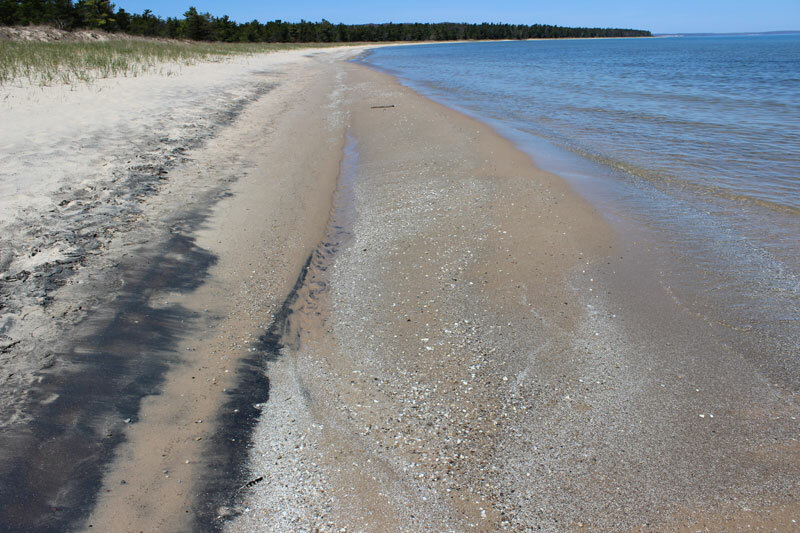 The beach/dune system extends eastward from the Point Pyramid headland to Carp River Point, just south of Leland. The beach is widest in the inner-most part of the bay, like the Platte Bay Beach, beginning at about the mouth of Shalda Creek on the west end and narrowing where the shore trends back to the north. The beach shows a variety of interesting beach features including bar attachment similar to the other bay beaches (Figure 11). At times, higher energy waves generate placers of fine heavy-mineral rich, dark sands. Good Harbor Bay is clearly the remnant of a once greater embayment that extended south into the area that is now Little Traverse and Lime Lakes. With time and as lake levels fell, a series of spits and beach/dune ridges formed, separating these lakes and forming a distinct topography of low ridges and swales, although difficult to recognize under the forest cover. The present shoreline provides a good view of modern dune evolution, and an example of how the earlier ridges formed (Figure 12). The sands making up today’s dunes and beaches have been recycled many times – perhaps having come from Canada as glacial sediment, carried by melt waters from those glaciers, and those deposits eroded by ancestral lakes, carried by waters and wind in bars, beaches, and dunes, over and over. 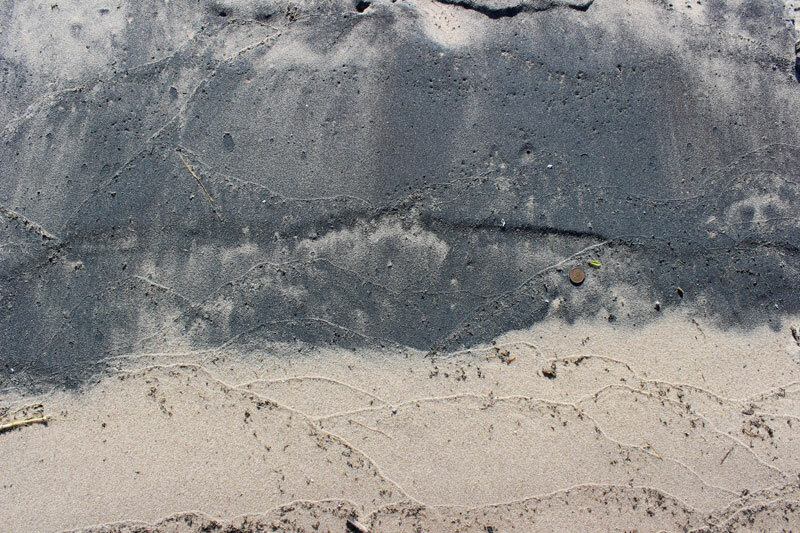 Like most Lake Michigan beaches and associated dunes, the sands of these two features at Good Harbor Bay Beach are the same composition, and differ only slightly in grain size (Figure 13). These beaches and dunes are dynamic landforms, characterized by natural processes that are hazardous from the human point-of-view. These shorelines have been and continue to be eroded. Calm sunny days of summer have led many to settle on the shores of the Great Lakes without knowledge of the terrible storms that lash the coast, or that fluctuating lake levels are like the tidal range of oceans, extending the zone of hazardous conditions landward. Landslides, slumps and creep create hazards even from gravity. And dunes migrate, burying forest and threatening property. Sleeping Bear is no exception. The first safety precaution at the shore is to heed the rip-current warning signs. In addition, steep slopes have an attraction, but losing your footing can have serious consequences. And yes, landslides do occur in the dunes. 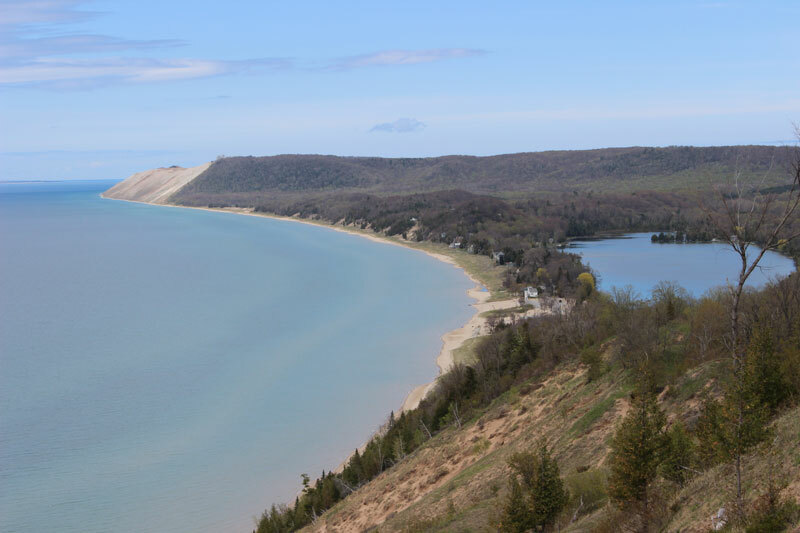 In 1995 a large landslide occurred at Sleeping Bear Point, depositing approximately 1 million cubic meters of sediment on the adjacent lake floor, extending more than 2 miles offshore! Similar slides occurred in the same area in 1914 and 1971 (refs. 5, 6). Even in undeveloped park and wilderness lands, shoreline change must be accounted for in planning, and the USGS has assessed all of the Great Lakes National Lakeshores for coastal change potential (ref. 7). 1. The Official Website Of Sleeping Bear Dunes:Provides general visitor information on Sleeping Bear Dunes and the area including maps, events, and activities. 2.The Park Service’s official web site for Sleeping Bear Dunes: provides background information on the park and visitor information for planning a visit to the area. 3.National Park Service, Explore Nature : “geology fieldnotes: Sleeping Bear Dunes National Lakeshore Michigan” 14p. This on-line reference provides a good discussion of the glacial/post-glacial history of the region, the origins of the array of land forms in the Park, and an extensive list of references for those interested in the geology of the region. 4.Geological Society of America Centennial Field Guide— North-Central Section, 1987: Milstein, R. L., 1987, Sleeping Bear Dunes National Lakeshore, Michigan: Geol. Soc. America Centennial Field Guide – North-Central Section, 3p. Nice brief summary of the region’s geologic history. 5. Barnhardt, W.A., Jaffe, B.E., Kayen, R.E., and Cochrane, G.R., 2004, Influence of near-surface stratigraphy on coastal landslides at Sleeping Bear Dunes National Lakeshore, Lake Michighan. Journal of Coastal Research, v. 20, p. 510-512. 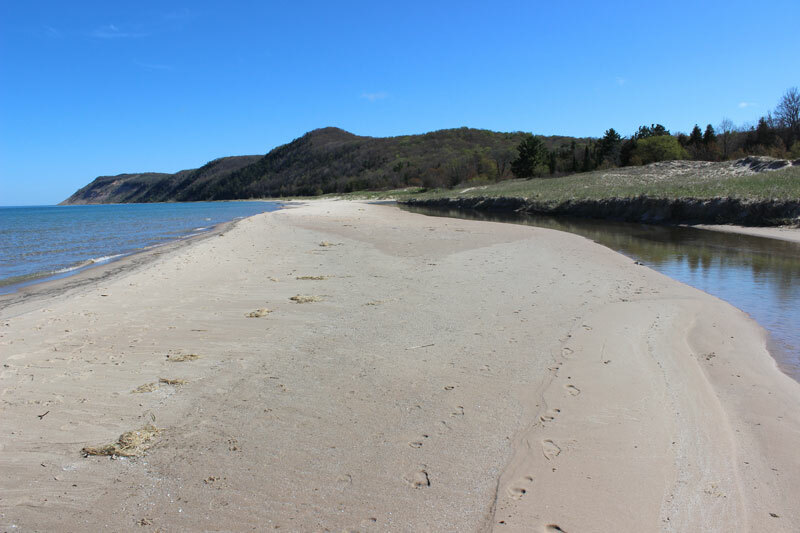 6.USGS Fact Sheet 020-98 Online Version 1.0.Jaffe, B., Kayen, R., Gibbons, H., Hendley II, J.W., and Stauffer, P.H., 1998, Popular Beach Disappears Underwater in Huge Coastal Landslide – Sleeping Bear Dunes, Michigan. 7. Pendleton, E.A., Thieler, E.R., and Williams, S. J., 2005, Coastal Change-Potential Assessment of Sleeping Bear Dunes, Indiana Dunes, and Apostle Islands National Lakeshores to Lake-Level Changes: U. S. Geological Survey 2005-1249, 48p.